Webinar Overview: To provide an brief legislative update on the transportation funding discussion, answer your questions and share how you can have an impact on the discussion. The call-in number and participant code will be emailed to you after you submit your registration. For more information or if you have questions, please contact Kathryn Gray, Trans4M Coordinator. 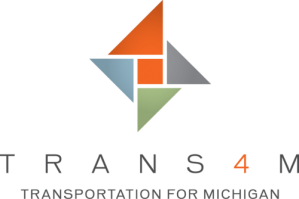 Follow the Trans4M blog to read weekly updates on the transportation funding discussion happening in Lansing.